Of all the notable mountains in China, the Yellow Mountain, aka Mount Huangshan, is probably the most famous and can be found in the south of Anhui Province. It is famed for its stunning and peculiar natural sceneries composed of four wonders, namely unique guest-greeting pines, absurd stones, sea of clouds and amazing hot springs, as well as high peaks, strange pines and glacial landforms. The fairyland-like Huangshan national park occupying an area of 160.6 square kilometers (39,700 acres) boasts not only attractive scenery but also abundant resources and a great variety of zoological species, for which it has been listed as a World Natural and Cultural Heritage Site. In different seasons around a year the mountain has various and unique beauty, such as the wild spring flowers, specular summer waterfalls, colorful autumn leaves and white winter rime. However, every year, from December to the following March, the West Sea Valley and Heavenly Capital Peak (Tiandu Peak) are closed for winter maintenance. Correspondingly, the West Sea Valley cableway temporarily stops receiving visitors. 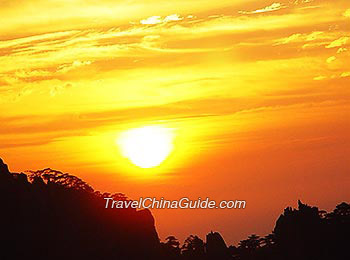 Huangshan scenic area mainly consists of six particular areas. Inside the Jade Screen, you can catch sight of lofty mountains, precipitous slopes and antiquated stone carvings. The distinguished Guest-Greeting Pine can be found here, too. From North Sea to Pine Valley, not only the jungle-like steep mountains, but also the lush and verdant pines and cypresses would leave you with a deep impression. The gurgling spring water and imposing waterfalls in Hot Springs and White Cloud will feast your eyes on their distinct beauty and magnificence. With quiet environment and relatively flat paths, the secluded Cloud Valley is suitable for an easier Huangshan hiking. The famed four wonders are 4 unique views belonging to Mount Huangshan, namely Strange Pines, Absurd Stones, Sea of Clouds and Hot springs respectively. There are hundreds of rare pine trees in Huangshan. As one of the landmarks of Huangshan, the most famous Guest-Greeting Pine stretches out for about 10 meters (33 feet) from the sheer cliffs, like an usher in a respectful greeting gesture. The absurd stones can be seen almost on every peak of Huangshan Mountain. From different viewing angles, the stones look like human beings, animals or other objects. Accordingly, they are given different vivid names such as Monkey Stone and Flying over Stone. Sea of Clouds is known for its beauty, scarcity, marvelousness, and flexibility. You would be lucky to see this rarely seen scenery as it only occurs around 50 days in a year. The whole mountain is as pretty as a huge ink-wash painting when enveloped in the misty clouds. 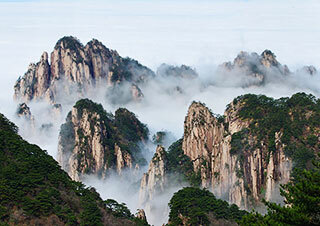 Looking at the floating clouds pouring down from mountaintops will highlight your Huangshan trip. The Cloud Valley Temple of back Huangshan and Merciful Light Pavilion of front Huangshan are two starting points for a Huangshan hike respectively. In general, for saving physical strength, most tourists like to go up the mountain from its south gate in back part and leave from the north gate in front part. Visitors from Hefei, Nanjing and Anqing can enter the mountain via the north entrance through Taiping. Visitors from Shanghai and Hangzhou can go through Tangkou, the south entrance. As to Huangshan Cable Cars (cable car stations), Taiping Cable Car is close to the north entrance; Yungu and Yuping ropeways are closer to the south entrance. 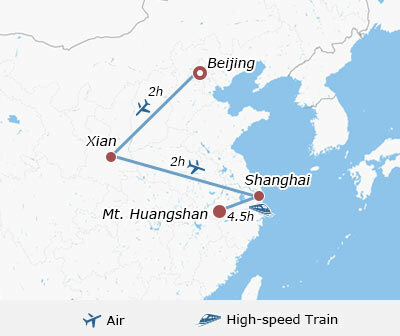 If visiting Huangshan by air, from Huangshan Airport, passengers can take bus no. 19 to the city’s Passenger Transport Terminal, also called Tunxi Bus Station located at no. 31 Qiyun Avenue. There are regular buses to the Yellow Mountain scenic area and the bus fare is CNY 20/ person. From Huangshan airport, the taxi fee to the scenic area directly is around CNY 200. If arriving at Huangshan North Railway Station by bullet train, transfer to a tour bus or taxi in the front square of the station to the transfer center of Mount Huang. The tour buses depart from 08:00 to 20:20. You can also hail a taxi from the railway station to Huangshan, and it would cost around CNY 160. There are many regularly direct buses departing from most Chinese cities to Huangshan, so taking the long-distance bus would be one of the available choices to get to Yellow Mountain. It takes about 6.5 hours and the ticket price is CNY 148 per person. Ticket fare: around CNY 100. It takes about 4 hours and costs about CNY 90 per person. Bus fare: CNY 60 – 80. The duration is about 4.5 hours. No direct bus. Note: Generally, the ticket is valid for one entry with an unlimited stay length. So if you want to spend more than one day there, you can camp or lodge in a hotel within the scenic area. If you want to exit after the first day's visit and reenter on the next day, you need to register and obtain proof at the ticket office before leaving. 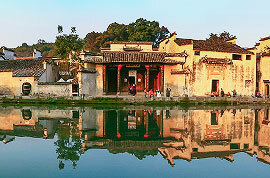 Further Reading: Xidi, Hongcun, Shexian - The Town of the residential houses from the Ming and Qing dynasties. I would like to hike Huangshan by foot. I arrive at Huangshan North Railways Station, which car and which gate shall I took to Huangshan? Hello, I am planning a trip for May and I'm arriving at Huangshanbei station at 3:30. I am an experienced hiker and wanted to get into the park on the same day I arrive. However, I've heard the buses into the park stop at 4:30. Is this true? Do you think I will be able to get into the park and stay at a hotel inside or will I have to stay in the city the first night and go to the park the next day? Thanks. Oh, don't worry. The direct shuttle buses from North Railway Station to the mountain area depart until 20:20. Thus you can get into the park and stay at a hotel inside the scenic area. However, the you need to get into the scenic area before 16:30. What is the best cable to reach Huangshan Baiyun Hotel? You are suggested to take the Yungu (Cloud Valley) Cable Car. After that, you need to walk around 40 mins to arrive at the hotel. Hello, do you know if the Huangshan four cables are on working? Yes, the cable cars of this mountain area operate during this period of time. West Sea trail open in April 2019? I will be visiting Huangshan on April 2nd and 3rd. Will the West Sea trail be open? I've read it closes during the winter. Thanks! Don't worry. It will open in April.